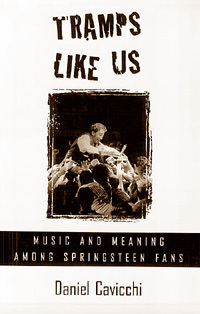 Tramps Like Us: Music and Meaning Among Springsteen Fans. By Daniel Cavicchi. A look at Springsteen's fans and how they relate to his music, showing that music fandom is a useful and meaningful behavior that enables us to shape identities, create communities, and make sense of the world--both Bruce's and our own. Cavicchi himself is a fan and teaches American history and culture at the Rhode Island School of Design. Oxford University Press, softcover, 222 pages.